So tonight is our last night of camping in our rented 5th wheel. Overall it’s been really fun vacation. My hubby and I have really enjoyed each other’s company and have gone outside our usual comfort zones. We’ve hiked many trails within the Smoky Mountain National Park. There are many great scenic drives and destinations. We saw some great wildlife including the bear in the picture above. The bear really was as close as it looks. It was a young cub but no baby. 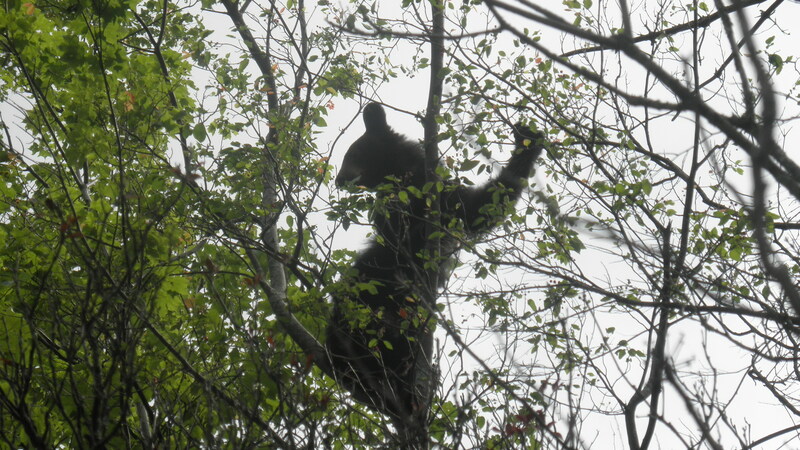 Sitting above us in a tree that looked far too weak to hold it’s weight, the bear did not seem bothered at all. It was happily munching on leaves or berries while a group of us below were snapping pictures hoping the branch would hold! After that experience we drove through rural towns such as Townsend and Wear Valley where we found some interesting antique stores as well as a local wood carver. The carver had just finished carving a beautiful bear and his wife was just starting to stain it. I fell in love and foolishly asked the price. It was only slightly out of my budget so today we found our way back to their location with cash in hand. He will serve as an adorable reminder of our vacation. I’m sure our dogs will find him quite intriguing. Driving back we drove past Walden Rd and then somehow crossed Walden Creek at least 3 times. It seemed a sign that his name should be Walden. Also, every other name my husband came up with was just plain awful! As for my fears of being a vegetarian up in the mountains, they were well founded. First of all, while the scenery is gorgeous, Gatlinburg and Pigeon Forge are basically tourist traps, something I usually avoid. With that said, our first night we ate at Jose’s Cantina which was typical overly heavy mexican food but I did manage to order and enjoy enchilada’s florentine. We did a bit of cooking in the camper and on the grill which I enjoyed. One evening I decided to have mercy on my husband and offered to go to Alamo Steakhouse which boasted a “veggie plate.” In reality this was a side salad with 3 side dishes for $13! After our server asked for the 3rd time if I wanted cheese on my broccoli for protein I not so nicely explained to her that ounce for ounce broccoli has the same amount of protein as steak. Well she looked surprised and bothered by me. The mushrooms and onions were my 2nd choice of side which after eating a few bites I realized had beef broth in them. It’s been awhile since I’ve tasted beef anything. Good news is that the sweet potato was very good as was the salad with homemade poppy dressing. Lunch today was in a cafe inside a country store where I had a grilled swiss and tomato and some baked steak fries. It was actually quite good. I can’t imagine how I would have managed if I were vegan. I lived in Tennessee a long time ago, but in Knoxville, which is a university town. I love the Smokies, love camping and hiking, but also love the artistic and personal freedoms that come with a University town. It makes being vegetarian a little more average.